The branched amino acids are formed by Leucine, Isoleucine and Valine . They represent 3 of the 9 essential amino acids that we must necessarily take from our diet to cover our protein needs and allow protein synthesis in our cells. Branched amino acids are present in various foods, especially of animal origin, such as chicken , beef , milk and fish , but also in legumes . They are also called branched chain amino acids or BCAA (English acronym of Branched-Chain Amino Acid) because, the 3 amino acids in question, have a particular chemical structure: their side chain is composed of carbon atoms joined together with a structure chained that branches. From a biochemical point of view this structure differentiates them from other amino acids due to the fact that, once absorbed by the intestine, they are metabolized only in skeletal muscle instead of passing through the liver. This is because the BCAA amino-transferase enzyme is not present in the liver, an organ designed to convert and route the other amino acids to the internal organs or tissues of our body. The branched amino acids make up 35% of the amino acids present in the musculoskeletal apparatus (in the form of proteins), but are present in free (ie non-protein) form in truly marginal quantities. What are the branched amino acids for ? Everything has been said and written about the BCAAs. Studies on their functions and on the scope of supplementation are wasted. In the case of a low carbohydrate diet or in the case of intense physical activity without carbohydrate supplementation before or during the effort, the body promotes the oxidation of BCAA. This process is implemented in order to maintain stable blood sugar, providing carbon as a substrate for gluconeogenesis in the Krebs cycle. Despite the dismantling of BCAAs for energy production, the blood levels of these 3 amino acids are kept high by degrading the proteins that make up the muscle to synthesize others. Supplementation of BCAA, supporting the processes of gluconeogenesis, is able to decrease muscle damage and production of lactic acid during intense training, promoting recovery and reducing the risk of injuries and illnesses. The basic point however is to understand how much they are able to do it. The literature to date is really doubtful about their effect that seems not relevant in the contexts where the protein needs are satisfied. The integration of BCAA should promote the increase in lucidity and focus while also improving the mood and physical performance of those who use it. BCAAs have been shown to play an important role in the synthesis of glutamate and GABA neurotransmitters, which contribute to producing energy when needed. The BCAAs also prevent the entry of free tryptophan into the brain. The latter is an essential amino acid that, when it overcomes the brain barrier, is converted into serotonin, a brain neurotransmitter that promotes a sense of calm and relaxation. Also on this point, unfortunately, the research is very doubtful on the real effects. It would seem to work as well as the placebo effect. And the much praised stimulation of protein synthesis in the gym is attributed to this supplement? If you read carefully the clinical studies, which speak of scientific evidence between the supplementation of BCAA and an increase in protein synthesis, the only amino acid responsible for this process is the Leucine – Valine and Isoleucine only play an energetic function. It would therefore be responsible for stimulating muscle protein synthesis through signals that involve mTOR (regulator of muscle protein synthesis) and insulin production. Finally, it is commonplace to say that protein synthesis occurs only if all 9 essential amino acids are available in our body. If we follow a low-calorie diet, with a minimal protein intake, we can take all the Leucine or all the BCAAs we want, but protein synthesis will not start. On the market we find branched amino acid supplements with the most disparate formats, the strangest formulations and degrees of production quality. Among the most common formats we find those in tablets (usually 1g) and powdered ones. 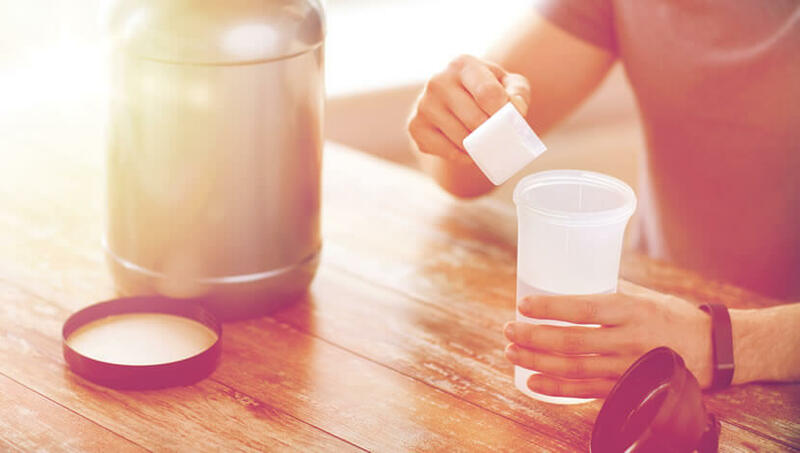 With regard to the latter, given the high foaming power of Leucine, which makes it difficult to dissolve them in water, in recent years they are found in BCAA in instantized powder. To them is added soy lecithin – with perhaps some flavor that makes it more pleasant flavor – as a blast chiller of foaming power to make them easy to mix and enjoy. Given that among the three branched-chain amino acids, leucine is considered the most important , the formulations of the most common supplements are in a 2: 1: 1 ratio where on the total we will have: 2 parts of Leucine, 1 part of Valine and 1 part of Isoleucine. So if we take one tablet it is 1 gram, in it we will find: 500 mg of Leucine, 250 mg of Valine and 250 mg of Isoleucine. In recent times, fashion and marketing have commercialized formulations of branched amino acids with different proportions, such as 3: 1: 1, 4: 1: 1, 8: 1: 1, up to 12: 1: 1. In fact, if you already take 2.5-3g of leucine per meal, additional doses do not increase the anabolic effects. The quality of the supplements we want to take is a fundamental component to keep under control. Among the 2 most important trademarks registered for the purity of the products we find Kyowaand Ajiinomoto . Finally, to meet the growing needs of the followers of vegan diets, we find the BCCA derived from plant-derived ingredients, produced through an innovative fermentation process (which certifies the quality of the final product in itself). Branched Amino Acids – When to Take them? Now that we know what the specific characteristics of branched amino acids are, we can certainly say that the massive use of all types of sports (power or endurance) is certainly not justified. The anticatabolic and ergogenic properties make it a suitable supplement in particular periods of the year. A suitable use that can be done is certainly in periods of diets with a strong caloric restriction, where carbohydrates and proteins do not meet the daily needs of the subject. preserving lean mass during physical exertion, providing amino acids to produce glucose, thus preventing muscle catabolism. promote focus and energy during training due to its characteristic of the amino acid tryptophan inhibitor. A practical example can be a subject placed in a caloric restriction regime, not covered by an adequate protein intake, which follows an intermittent fasting protocol with fasting training. An integration with a large dose of BCAA (10-15g) a 30 minutes before training is certainly a good help for the reasons described above. If, however, in periods of low-calorie we are covered at the protein level, the integration of BCAA is superficial as our body will have in circulation all the amino acids necessary to synthesize branched amino acids without carrying out processes of muscle catabolism. In all other cases, that is to say in periods of normo or hyper alimentation, where carbohydrates and proteins are introduced in sufficient quantities, the integration of branched amino acids is ineffective if not even counterproductive. Taking BCAAs in the peri-workout will lead to lean body protection. All that goes to protect the lean mass, however, decreases muscle damage by definition. Less muscle damage and a lower production of lactic acid will result in a lower anabolic rebound in the post workout. Scientific research has shown that, with the depletion of glycogen stocks in our body, the enzyme involved in the oxidation of the branched amino acids in the muscle is activated. Therefore, ensuring optimal reserves of muscle glycogen during training – for example, by taking a drink containing carbohydrates – should prevent the oxidation of BCAAs during physical activity, protecting the lean mass. For its effect of tryptophan inhibitor, finally, we advise against taking branched amino acids in the late evening because, being the tryptophan the precursor of serotonin (the hormone responsible for the sense of relaxation and well-being) could trigger mechanisms that could lead us to have a disturbed sleep. Branched Amino Acids – Which to Take? As we have seen on the market we find the most varied formats and the strangest formulations for this integrator so much praised in the world of sport. The first advice we can give to those who want to venture into the purchase of a branched amino acid supplement (in case it is really necessary to hire them) is to focus on the quality of the product (we do not take a euro to write it). Kyowa, Ajiinomoto or amino acids produced by fermentation are definitely quality grades to look for. As for the formats we recommend the classic formulation 2: 1: 1. Fashion and Marketing are creating products with increasingly unbalanced formulations towards Leucine (we arrived at 12: 1: 1 where, in a 1g tablet, Valina and Isoleucine are now present with minimum values). If we want to maximize protein synthesis and the production of insulin it is more convenient, at this point, to buy a good Leucine supplement, then adding it to simple BCAA 2: 1: 1, obtaining the same effect and a considerable economic saving. Branched amino acids are, among the supplements on the market, the safest and best tolerated ones. Being naturally present in foods makes them perfectly tolerable on an intestinal level. By bypassing the passage in the liver, overloads to this and other internal organs are avoided. Side effects related to excessive consumption of branched amino acids, would be gastroenteric episodes, with heartburn and diarrhea. Despite the good tolerability of the organism, the supplementation of branched amino acids should be endorsed by your doctor, for those affected by renal diseases or congenital enzymatic deficiencies, hepatic encephalopathy, large burns, extensive trauma, severe liver disease and pathologies neurodegenerative diseases such as amyotrophic lateral sclerosis. The same attention should be paid to pregnant women and the subsequent period of breastfeeding. See Another Article: Protein powder do they hurt?